In Singapore, people certainly don’t cook at home. They buy and eat their food in Hawker Centers! Therefore you will find very quickly place to eat while being here. Hawker Centers house many stalls that sell a variety of inexpensive food – the food that locals eat. The food centers provide tables and chairs for customers, so you don’t have to eat on the street. 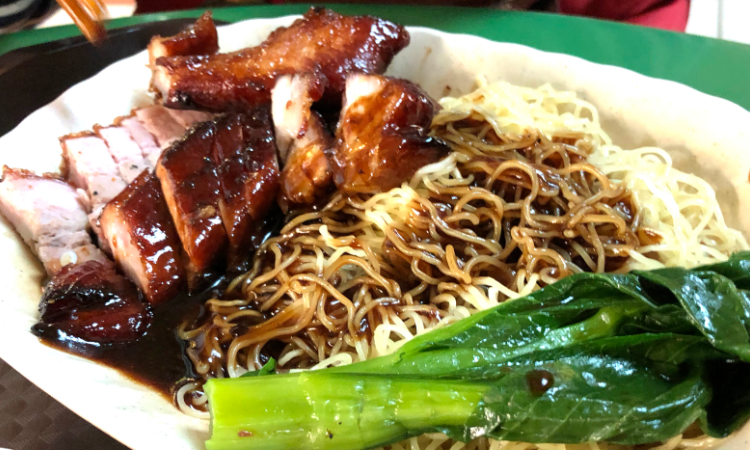 In this Food you must try in Singapore post you will find 3 dishes that we have tried in Maxwell Food Center which were just extraordinary. Maxwell food center is very easy to rich, it’s about 5 minutes walk from China town, and we found it without a problem. 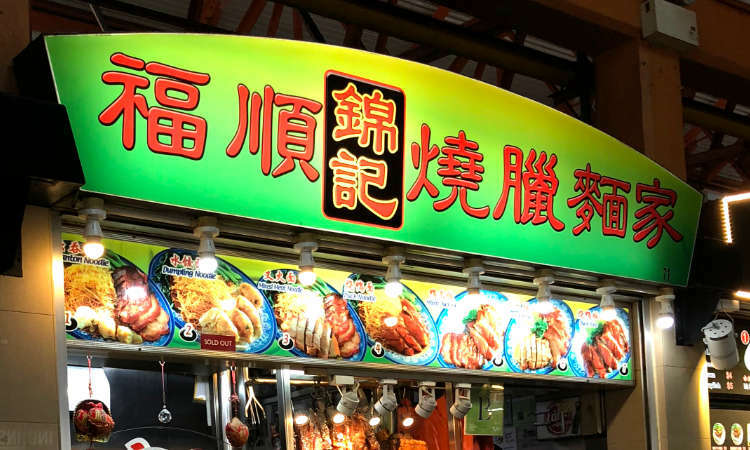 1) National Environment Agency regulates the retail food industry in Singapore and has created a grading system for Eating Establishments and Food Stalls. Retail food establishments are given a grade based on the overall hygiene, cleanliness and housekeeping standards of the premises therefore on every stall; you can find a letter. I would recommend buying just food from the stalls that have A or B on them, as those stalls have already acceptable hygiene standards. 2) No touting rule at Maxwell Food Center – which means none of the vendors will seek your attention and try to convince you to buy food from its stall! What a relief! 3) The food centers can get busy at particular hours but there is a way of securing seats at those times, and it’s called “chope.” The first thing what you should do to reserve a seat is to find an empty table and mark your territory — by putting the cheapest or most useless personal item – usually a tissue or tissue pack. So remember! If you see a tissue on the table without reason, the place has been already received! 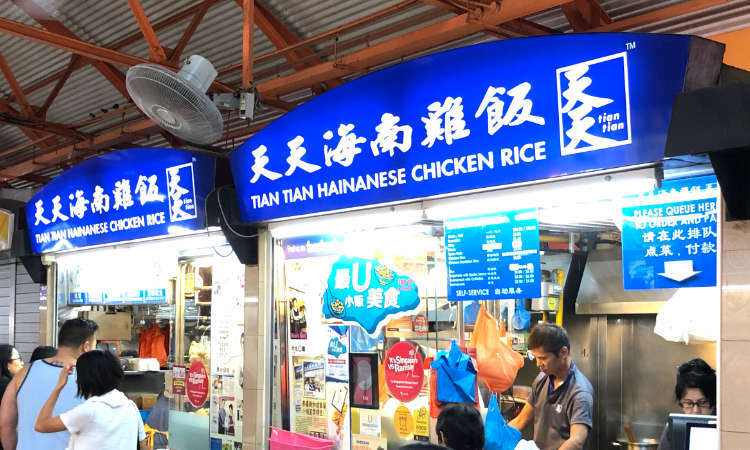 This stall is in the Michelin guide in Singapore: https://guide.michelin.sg/en/behind-the-bib-tian-tian-hainanese-chicken-rice and there is a reason for that: This is is one of the best Hainanese chicken rice in Singapore. The dish is all about the pure taste of the chicken that is before cooking filled with ginger and spring onions and salt. The chicken has to simmer until it is ready and then has to be soaked in the pot with ice. This way it remains juicy. In the chicken broth, they cook the rice and therefore also the rice tastes terrific. 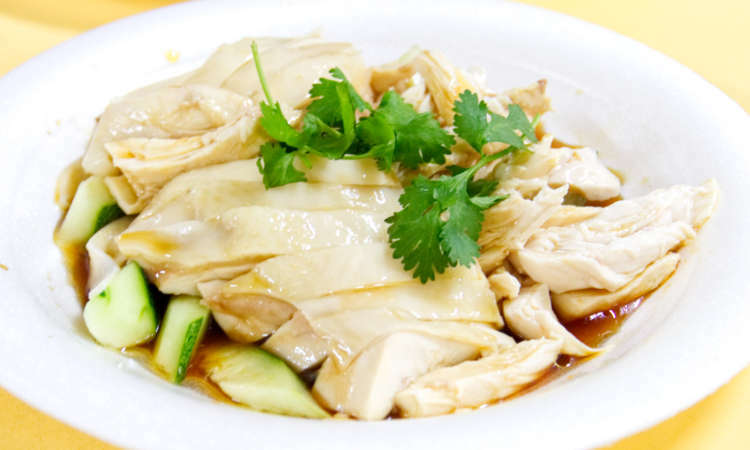 The chicken is served cold with thick sauce on the top, and chili sauce on the side. I am not sure what is that sauce on the top, but honestly, it was so delicious! This was another stall with the longest queue, so we decided to give it a go! The roasted pork belly was on our list of the food to try, and that looked just so delicious that we couldn’t resist. The portion was very generous, and the meat was soft, juicy and crispy at the same time. The pork tasted smoky, sweet and caramelized. Just heaven in the mouth! Next time I would take the meat with rice because the noodles were not this great. We left them on the plate. The next stall that we decided to try was the dim sum stall. We ordered a portion of little pork dumplings, which were served with soy and ginger sauce and chili sauce. The skin of the dumplings was perfectly crispy, and the filling had the right amount of spices. 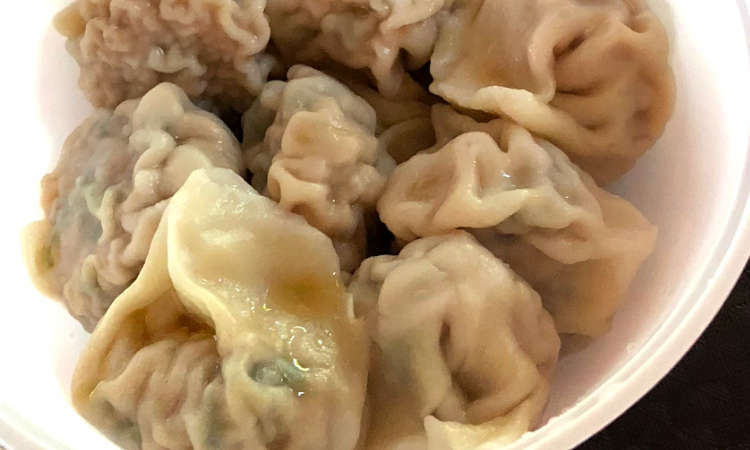 We can honestly recommend this stall if you like dumplings! I hope you enjoy this blog post and our video. If yes, please give us a thumbs up and subscribe to our channel for future videos. Happy eats and safe trip!